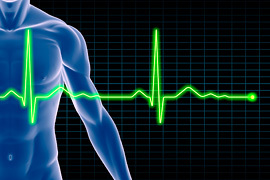 The electrocardiogram, or EKG, is used to evaluate the electrical and muscular performance of the heart. An EKG measures the rhythm and rate of your heartbeat and is routinely performed by Dr. Jamshid Maddahi in his Los Angeles office. Your heart is a vital pump. Problems with the electrical activity of your heart can be the root of a heart problem. There are many corrective methods to repair a heart that no longer functions optimally due to electrical malfunctions. The electrocardiogram itself is common, easy to administer, and non-invasive for patients. However, the interpretation of EKG requires a lot of training. It is essential when selecting your cardiologist that experience and training play a vital role. Los Angeles cardiologist Dr. Maddahi brings both training and 35 years of experience to his practice. He is sought world-wide by other cardiologist as a consultant on their patient care. As a dedicated leader in the field of cardiology, he is your best choice when seeking diagnosis, care or prevention of problems affecting your heart.